I remember the first time I went to Harry Caray’s. Tommy was a young boy and wanted to go there after a Cubs game. I did not expect any more in the way of food than burgers and fries. Was I amazed! This is a restaurant for the record books. 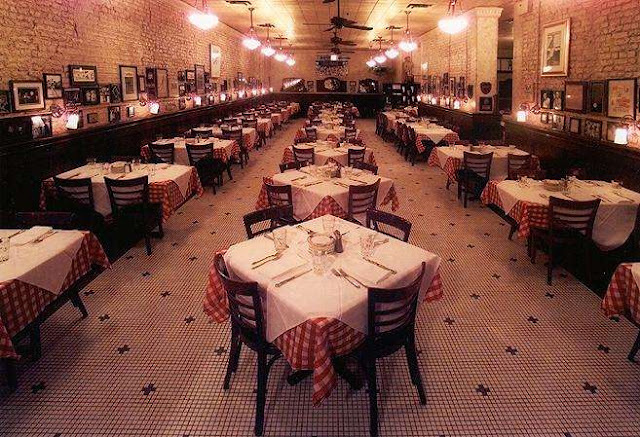 The original Harry Caray’s at 33 West Kinzie, Chicago is a celebrated Italian Steakhouse that serves the finest prime, aged steaks and chops. Harry Caray's has won countless awards including "Best Steakhouse" by the Chicago Tribune's Dining Poll and Best of Citysearch Poll, Wine Spectator's "Award of Excellence" every year since 1989, and has been ranked in the top 100 highest grossing restaurants in America. Also, pardon the pun, it’s a cash cow. I have never been there when it wasn’t packed! My favorite part of the restaurant is the bar, which spans the length of the room (60 feet 6 inches I am told) on the right as you walk in. They serve one of the best Bloody Marys and it’s always crowded with sports fans so scramble for a seat if you happen to spot an open one. 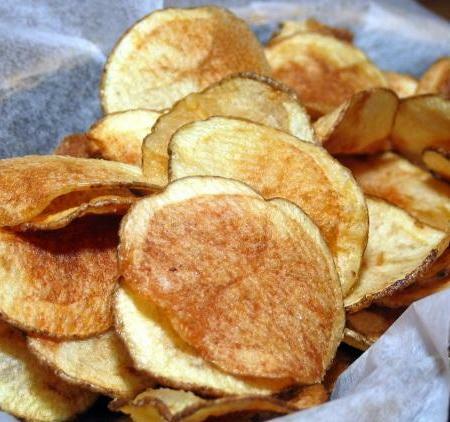 They also make homemade potato chips which are really good and no – you can never eat just one! This place has two faces: Tommy loved the “museum of baseball history” scattered throughout the restaurant. That was the casual side. The “other side” is mahogany paneling, starched white tablecloths and is relaxed elegance. 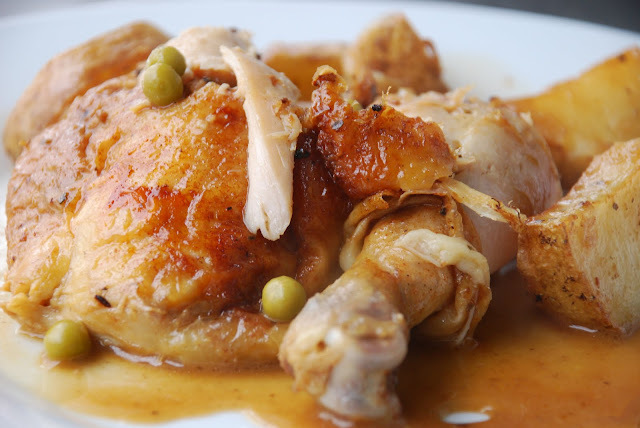 The first time I was there, I ordered the Chicken Vesuvio and it was wonderful. About 2 years later, I bought a cookbook and in it was Harry Caray’s Chicken Vesuvio recipe. The cookbook was worth the price just for that recipe. I had it there again last week and when I made this recipe today, I was surprised at how close it is to the real thing. In 12” ovenproof skillet, heat oil and whole garlic over medium high heat 4 to 5 minutes till garlic is golden. Remove from skillet. Add potato and cook 15 minutes or until golden, turning often. Remove and pat dry. Add chicken, skin side down, to hot oil. Brown slowly over medium heat, about 10 minutes. Turn chicken skin side up and season with oregano, garlic powder, 1/2 teaspoon salt and 1/4 teaspoon pepper. Add wine to skillet and return potatoes and garlic to skillet. Place skillet in 400 degree oven and bake, uncovered, 25 minutes or until chicken is done. Add peas with 5 minutes left on the timer. Watch for the review on the new Harry Caray's which opens at Navy Pier next week!